I inherited a major sweet tooth—for chocolate. I prefer dark chocolate that falls between milk chocolate and bitter-dark. Even better when it’s crossed with peanut butter, caramel or mint. Toffee, coconut or honey bits make me weak in the knees. Go ahead, stir in some puffed quinoa or chili powder or chai tea. Have you ever tasted olive oil with dark chocolate? I’m into it. For all of my enthusiasm for chocolate in its many forms, it’s kind of funny that I haven’t tried making more chocolate treats. 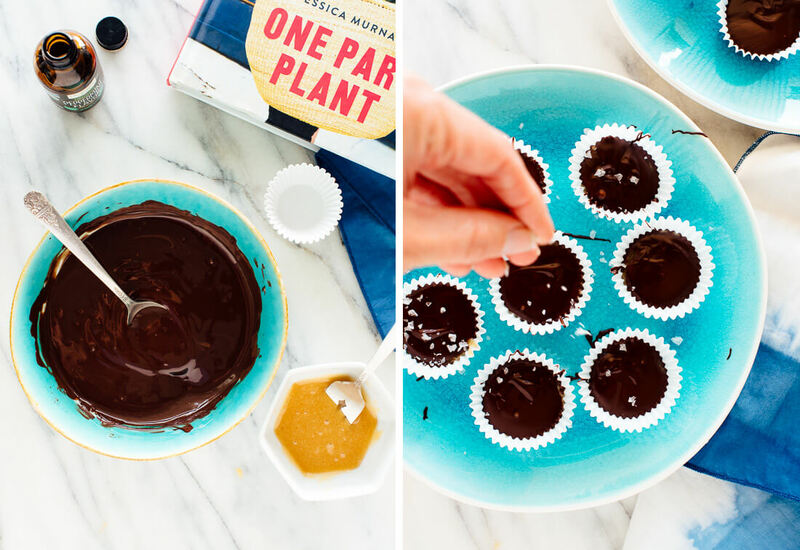 That’s why I got excited when I found this recipe for honey-sweetened chocolate peppermint cups in Jessica Murnane’s new cookbook, One Part Plant. They require only four ingredients (three, if you drop the flaky sea salt), about ten minutes of prep, and thirty minutes in the freezer. I dog-eared quite a few recipes in Jessica’s new cookbook to make, like the za’atar swirl bread and easy spicy miso soup. Most of them, like the baklava-ish toast, are super simple and seem perfect for busy weekdays. If you don’t know Jessica yet, she runs a blog that promotes plant-based eating, and a podcast in which she interviews super interesting people. Actually, two podcasts—she just released a new podcast that covers her entire cookbook-making process. I’m obsessed. Jessica discovered plant-based diets when she was struggling with Stage 4 endometriosis. Her symptoms decreased to manageable levels when she transitioned to a diet of whole foods. Isn’t that miraculous? I love stories like hers. I would never suggest that diet can cure all maladies, but I love to hear about people who have found their cures in foods rather than prescriptions. Like my friend Tessa, whose awful migraines disappeared when she stopped eating gluten. Jessica shares her story and 100 non-inflammatory recipes in her new book. They’re all dairy-free and gluten-free. I think I picked one of the only non-vegan recipes in the book to share. The peppermint filling contains raw honey, which is key because it’s thicker than regular honey or maple syrup. 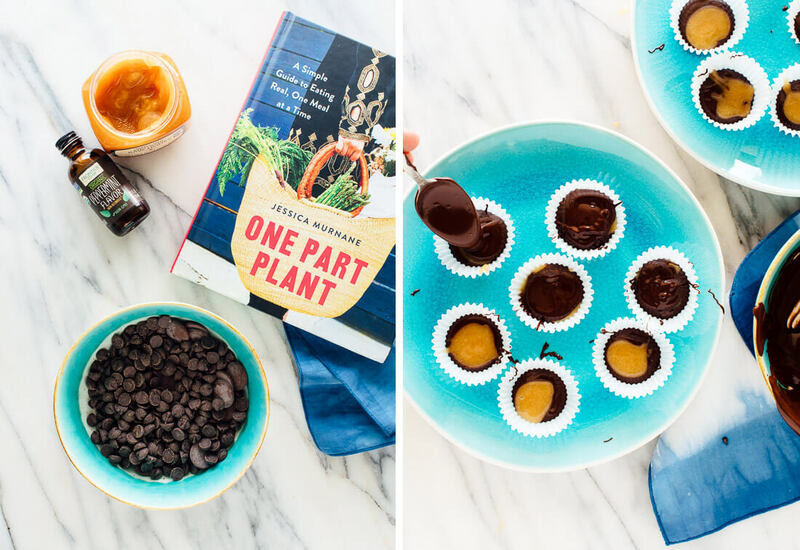 If you share my sweet tooth, I hope you’ll give these a shot. They’re a fun alternative to those expensive gourmet varieties that I mentioned above, and just one can satisfy my chocolate cravings for the day. Although, sometimes I go back for another, and then maybe another. They’re that good. 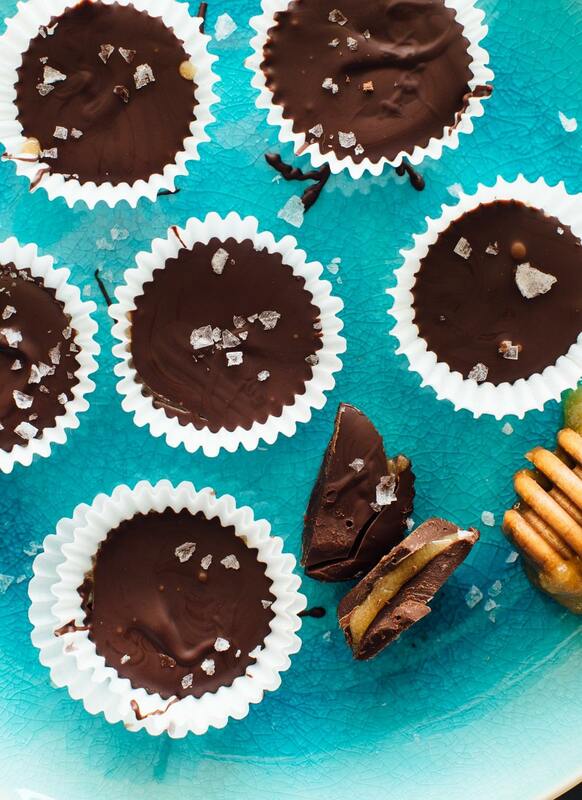 Delicious honey-sweetened chocolate peppermint cups! 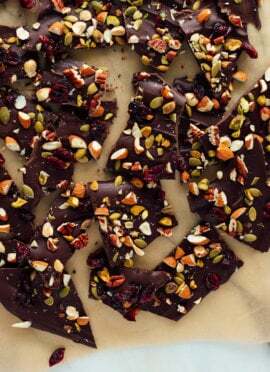 These dark chocolate treats are fun and easy to make. Recipe yields 12 to 15 mini peppermint cups; multiply if necessary (you’ll need that many mini cupcake liners—look for them in the baking aisle). In a small bowl, stir together the honey and peppermint extract until combined. Arrange mini cupcake liners on plate(s) or fill a mini cupcake pan with the liners, if you have one. Melt the chocolate (I did this in the microwave in 30-second bursts, stirring after each one, or you can use a double boiler on the stove). Fill the bottom of each cup with 1 teaspoon of the melted chocolate. Add a small dollop of the honey mixture in the center, then top it with another teaspoon of the chocolate. Sprinkle a little sea salt over the cups (note: if you want the salt to stay visible on top like mine, wait until the cups have chilled for about 5 minutes to sprinkle with salt). Freeze the candies until firm, about 30 minutes, then they will be ready to eat! For maximum longevity, store them in the refrigerator in a sealed bag. Recipe adapted just a teeny bit from ONE PART PLANT. Copyright © 2017 by Jessica Murnane. 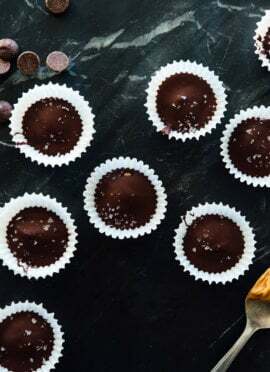 Change it up: To make other flavors of chocolate cups, Jessica notes that you can use any oil or extract that would pair well with chocolate, in place of the peppermint. She offered rose, almond, or anise as examples. Make it dairy free: Use dairy-free chocolate. See below for recommended brands. Make it soy free: Make sure your chocolate is free of soy derivatives like soy lecithin. Check out Enjoy Life and Pascha brands. Right? These are great to have on hand for sudden cravings. I hope you try them! 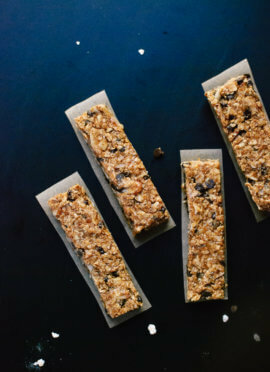 These look amazing and so easy to make. I’m they type of person who eats honey out of the jar with a spoon, so I love the idea of honey and chocolate combined. This one’s perfect for you, Alexandra! Trader Joe’s makes a dairy-free item like this but there’s no salt and the honey is not raw. I have them on hand, so I just tried one with my favorite flaky salt on top. It’s a good fit! I’m excited to make this with raw honey. I hope you try this homemade version! Yum! These look sinfully delicious! They are amazing, I can’t stop reaching for them! Yum! These look great and easy. What other flavors would you recommend? Hey Angie! They are super easy. Jessica suggested using almond, rose or anise oils instead of peppermint if you want to change them up. 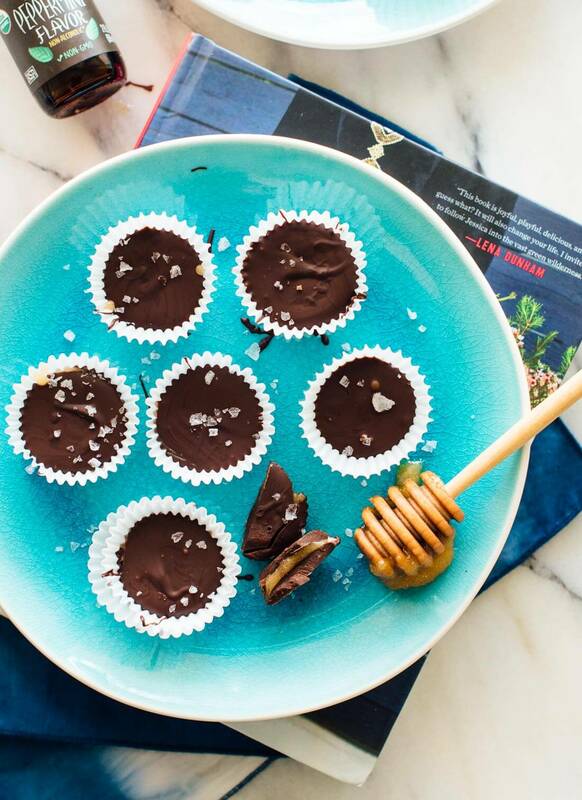 I also played around with the filling by mixing 1 tablespoon each of raw honey and almond butter to make almond butter chocolates—delicious! You could do the same with peanut butter, I think. Man, you made these so pretty! I love those big salt flakes too. THANK YOU! I really can’t quit these peppermint cups. Hope you’re really proud of your book! Hi Kate, I just want to tell you how much I LOVE your blog! It’s my favorite food blog out there (and I read a lot of food blogs.. lol). I think you strike the perfect balance between healthy, delicious, and food that is actually realistic and satisfying. You’re my go-to site for recipes whether I’m cooking for myself, my friends, my family – anyone! Thank you so much for all the work you put into this!!! Gillian, your comment really brightened my day! Thank you so much. :) I aim to be all of those things so I’m glad to hear you appreciate them! I absolutely cannot wait for you to get the cookbook. Food can be so underrated as a treatment for illness. (That being said, medicine exists for a reason and food’s not a wonder drug!) 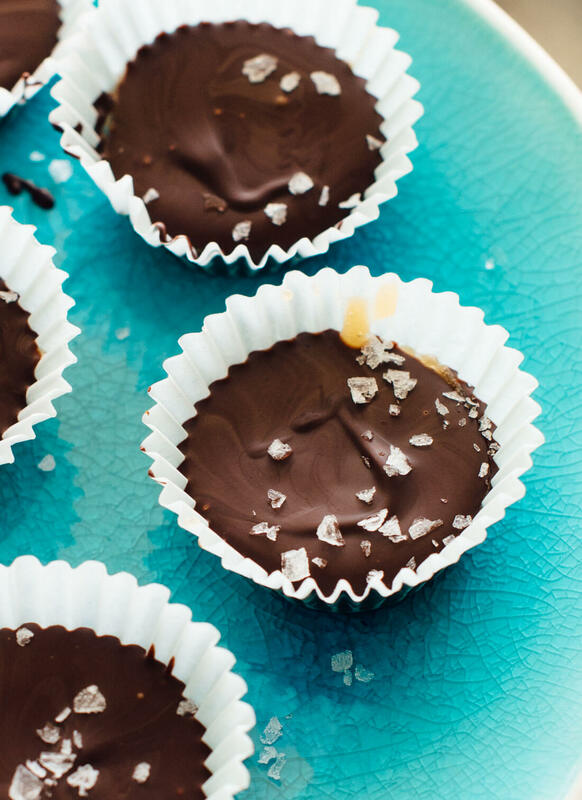 Chocolate and mint are two of my absolute favorite ingredients, and I’m sure adding honey to these just takes them over the top. I agree! Food is such a great healer, but not to the exclusion of medicine. My allergies alone are a testament to that! And you’re right, the honey makes these little guys irresistible. I already know I would love these little cups. Yum. Need to check out this cookbook! That was an amazing recipe. loved it! Oh my goodness Kate. These look amazing!!! I absolutely have to try to make this. And I’ve never tried chocolate dipped in olive oil. It sounds really good. It’s delicious, and those cups are just so stinkin’ cute. Did you say you had just finished your new cook book and it was available at Amazon, looked but couldn’t find it, what is the name? Thanks, Marcia! The book is called Love Real Food. OMG these are the best!!! So easy to make yet they look fancy and people are so impressed! They went fast. Can’t wait to make them again and try some other extracts! Thank you again for another amazing recipe! They are adorable and make for a really cute presentation. So happy you love them, Janell! oh wow, these peppermint cups look amazing, will have to try! also prefer dark chocolate a lot more, it tastes just so much better. thanks for the recipe! You’re welcome! I hope you try it. I cook. A lot. Desserts are what I’m known for by coworkers, friends & family. Was flipping through my new OPP cookbook and remembered you had highlighted these in a recent newsletter. These are a game changer!! Holy YUM!! I used peppermint oil (vs extract) and added a small piece of honeycomb on top. Ridiculous. THANK YOU!! These will be a staple in my freezer from now on. Oh, I’m so happy! Thanks so much, Steph– this is such a compliment. I’m so glad you love them! I made these today and they were (they are almost all gone) DELICIOUS. Thank you Kate! something I like to make I call ‘PB Hunny Cups’. The centers being a mix of peanut butter (natural of course) and honey. Get out yer muffin tins. Set cupcake liners in, melt chocolate and plop some o that goodness in each cup. Tap the tin on the counter to spread. Chill. Mix about 2/3 pb to 1/3 honey. The honey has a magical effect on the pb making it easier to handle. Form little blobs and set on waxed paper to cool. After they harden, take em out, squish a bit and put into the chocolate cup you already prepared. Melt more chocolate. Fill over the tops. Tap to fill edges. Chill again. Yummers. Great Christmas time or any family holiday ! I made these for my friend who just found out she is intolerant of LOADS of things and has been really miserable about it. She loved them! Thanks so much for your recipe, she really had a great new year! Thank you! That stinks for your friend! But, I’m happy to hear these worked. Thanks for your comment! I am planning to make these ahead of time for a fundraiser. Can I store them for up to a week in the freezer? Hi Stephanie, yes, I think so. I’m slightly hesitant to recommend it because I had some chocolate cups develop condensation on the outside as they came to room temp. It affected their appearance (not flavor), but might not be exactly what you’re going for. I made these for a potluck at work and my coworkers absolutely LOVED them! These are so delicious and so easy to put together. I used 60% cocoa dark chocolate chips since I love dark chocolate, and I had to stop myself from eating all of them. Such an easy treat for a large group of people. Will definitely be making these again. Great, Patrice! Thanks for your review. These are a new staple in my freezer. My kids love them and so do I. Another winning recipe from cookieandkate.com!